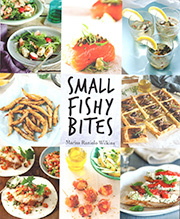 LAUNCH OF SICILIAN SEAFOOD COOKING AT MERCATO (Baccalaru ‘o fornu – Sicilian and Baccalà al forno- Italian). After the excitement and satisfaction of the successful launch of my book, Sicilian Seafood Cooking, in Melbourne on 6 November, and book signing event at Readings Hawthorn on 17 November, I drove to Adelaide, for the launch of my book in South Australia. The launch was hosted and organized by the team at Il Mercato, the Italian providore in the north-eastern suburb of Campbelltown, which is where my family settled after migrating from Italy. The local member and the State Minister for Education, Grace Portolese, MP introduced the South Australian event on Sunday, 20 November. I was thrilled and honoured that respected cook and cooking teacher, Rosa Matto, agreed to launch the book in my former hometown. Rosa and I have known each other for over many years and I have always admired her cooking skills, her generosity and her commitment to sharing her knowledge of food through her cooking classes. The launch at Il Mercato was very well attended. 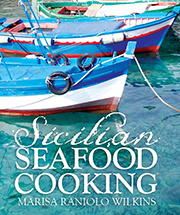 John Caporosa, the owner of the providore, had ordered 100 copies of Sicilian Seafood Cooking and on the day 99 were sold and signed. I am immensely grateful to John and his team, especially Cynthia and Lina who helped to make the event a success and prepared a selection of food: there were white anchovies and arancini and Lina selected and cooked two recipes from Sicilian Seafood Cooking, the Caponata from Catania (pg 362) and the Baked baccalà (pg 193). It was presented on a ceramic spoon – practical and attractive and very suitable for this occasion. Baccalà is cooked in many ways but this is probably my favourite – It is full of flavours and colours that can only be Sicilian. It can be presented as a main dish or as an antipasto. At Il Mercato it was served on spoons and everyone loved it. Baccalà. has to soak for a couple of days before it is cooked, so begin preparations beforehand ( min. 24 hours but if it is extra salty it will need extra time. It can be purchased pre soaked in some stores which sell Italian and Spanish food. Cut the baccalà into square portions and leave to dry on a paper towel. paste and seasoning and cook until thickened. Lightly coat the baccalà with flour and fry in hot oil. see if it is dry and either add more wine or water. Sprinkle with fresh basil leaves or extra pine nuts and serve with chopped chilli and a dribble of extra virgin olive oil. Cook any firm-fleshed fish this way. Large thick pieces are best.